The HMS Tetcott Archive was borne out of the original research carried out for the book ‘Tetcott – the thrill of the chase’. An incredible amount of primary material came to light as we progressed with our research, and it soon became apparent that we had far more available to us than we could actually fit into the book. The archive continues to grow and we are truly grateful to all who have either donated items or allowed us to make copies of photographs and documents in their possession. 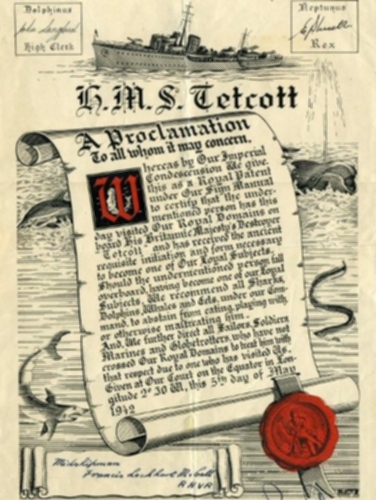 Without your generosity the creation and continuation of the HMS Tetcott Archive would not be possible. If you have any (original or copy) photographs, documents or articles you would like to contribute to the archive we would be very pleased to hear from you. Click here to send us an email. PHOTOGRAPHS: Amongst our worries when we set out to publish the book was the possibility that we would be unable to locate enough photographs to illustrate the story. However, our worries soon proved to be unfounded. The crew of HMS Tetcott were fortunate to have amongst their number at least one budding photographer who, on occasion, turned the radio room into a dark room, producing scores of photographs which were sold around the ship. 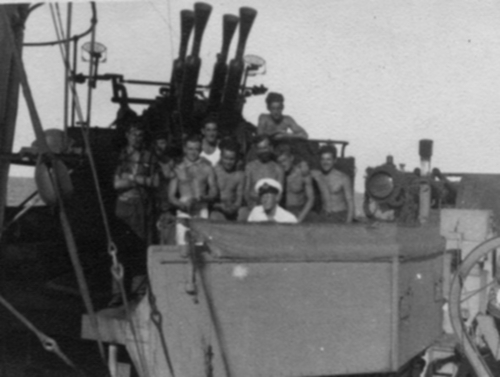 Consequently, the number of photographs taken of HMS Tetcott, her crew, and the events they were involved in, is far greater than one would normally expect to find. The Photographic Archive continues to grow (particularly photographs of former crew members) and we are always grateful to individuals who allow us to copy photographs in their possession. CONTEMPORARY DOCUMENTS: During the course of our research we were privileged to have been granted access to a number of incredible and unique documents, copies of which are now held within the archive. The largest single source is that belonging to the Rycroft family pertaining to their father Commander Henry Richard Rycroft OBE, DSC. 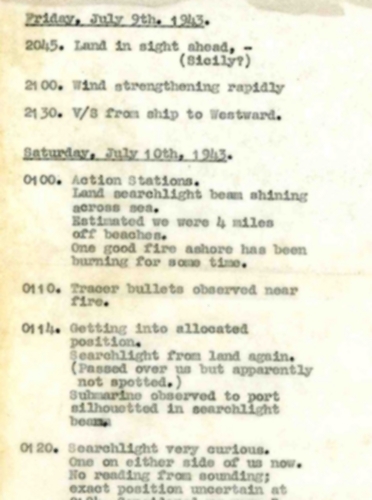 They include an amazing series of letters written between Rycroft and his wife between 1941 and 1943 which provide a personal insight into life on HMS Tetcott and include details of the commissioning and Tetcott’s collision with HMS Heartsease. Other documents copied from the collection include the original building receipt from White’s dockyard and numerous official reports submitted by Rycroft whilst Captain of HMS Tetcott. 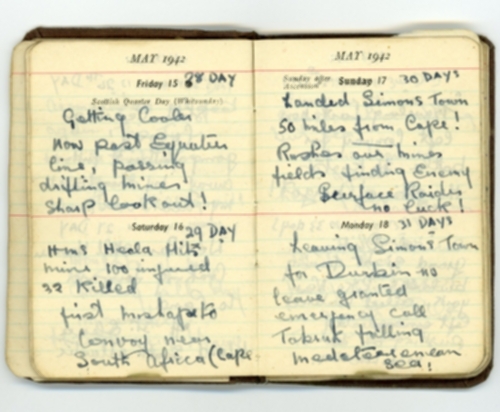 Other contemporary documents held by the archive include a 1942 Diary kept by Sick Berth Attendant Robert Smith recording events on board during Tetcott’s journey from the Clyde to the Mediterranean and copies of the notebooks and typed notes belonging Writer Jim McGregor written whilst on the bridge of HMS Tetcott during Operation Husky, providing us with a detailed record of the commands and orders issued by Lt Commander Rycroft as they were given. As well as the wealth of documents pertaining to the ship and its activities, we hold numerous private and personal papers including letters, service, enlistment and discharge papers. The Archive also contains a number of personal memoirs (many of them unpublished), including those of Lieutenant (later Rear Admiral) Dudley Davenport and Able Seaman Bob Stowell. ARTEFACTS: Although the smallest part of the Archive, we are proud to hold a number of items that give us a direct link with the ship and those who served on her. These include the Morse Key from HMS Tetcott's radio room, kindly donated by Mr Barry Johnson and a number of small brass key fobs stamped "H.M.S. TETCOTT". Perhaps the most unusual item in the archive is a German Iron Cross which was originally removed from the uniform of a downed German airman picked up by HMS Tetcott. 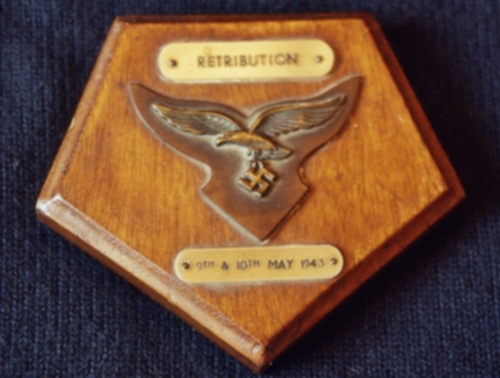 Given to Surgeon Lieutenant Tom Lewis by Rycroft as a souvenir, it was kindly donated to the archive by his widow in November 2009 (to read more about the donation of the Iron Cross to the Archive click HERE. Other items include a number of contemporary photograph albums and various souvenirs purchased by the crew of HMS Tetcott whilst in the Mediterranean.